McAfee & Taft’s annual labor, employment and employee benefits seminar once again attracted a record number of attendees in both Oklahoma City and Tulsa. 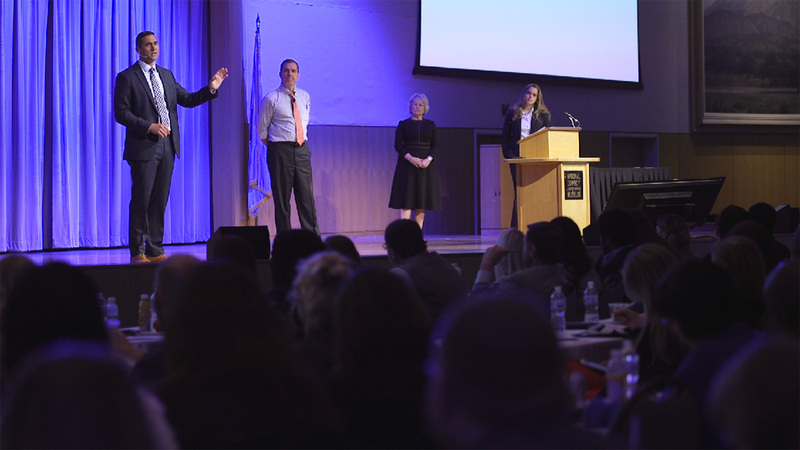 Nearly 1,400 human resource professionals, benefits managers, in-house counsel and executives registered for EmployerLINC19, making this event the largest HR and benefits conference in the state. The full-day seminar was held at the National Cowboy & Western Heritage Museum in Oklahoma City on April 3rd and at the Renaissance Hotel and Convention Center in Tulsa on April 4th. This year’s movie-themed event shined the spotlight on trending topics affecting the workplace and gave attendees a sneak peek into what the future holds for employers. Hosted by the Labor and Employment Group, the morning session began with began with “Clear and Present Danger,” with practice group leader Paul Ross providing an overview of strategies designed to limit the impact of employee litigation. Nathan Whatley, Phil Bruce, Samanthia Marshall and Charlie Plumb presented “The Magnificent Seven,” discussing the top seven Fair Labor Standards Act mistakes. Elizabeth Bowersox, Paige Good, Kathy Neal and Harrison Kosmider presented “Tomorrow Never Dies,” reviewing the latest developments in employment law. Kirk Turner, Kristin Simpsen and Jake Crawford presented “Dazed and Confused,” discussing how employers can manage drugs in the workplace while complying with state medical marijuana laws, drug and alcohol testing laws, and the Americans with Disabilities Act. The morning session concluded with “Some Like It Hot: Ice cold answers for your burning questions,” featuring an all-star panel moderated by Charlie Plumb and featuring Roberta Fields, Kirk Turner, Natalie Ramsey and Josh Solberg. Hosted by the Employee Benefits Group, the afternoon session was kicked off by practice group leader Brandon Long, who, along with special guest Brad Knowles of Heritage Retirement Plan Advisors, discussed how specially designed employee benefits programs and financial wellness programs could be used to recruit and retain the new generation of workers in their presentation, “Guardians of the Galaxy.” Judy Burdg and Jim Prince presented “Analyze This,” discussing trending topics in welfare plan administration and compliance. John Papahronis presented “The Good, The Bad and The Ugly,” examining what employers should know when it comes to their reliance on employee benefit plan consultants and vendors. The afternoon session concluded with “The Fantastic Four,” an all-star panel that featured Judy Burdg, Brandon Long, John Papahronis and Jim Prince answering the most frequently asked questions about trending employee benefits issues. McAfee & Taft is Oklahoma’s largest law firm and one of the nation’s top 250 firms as ranked by the National Law Journal.